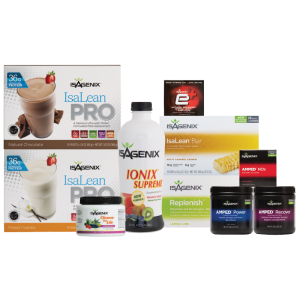 Isagenix AMPED PRO Pak - Amplify Your Results! Amplify Your Results in the Gym! The Isagenix AMPED PRO Pak offers a complete solution for active individuals and athletes. The products contain a mix of nutrients, natural caffeine, high-quality protein and amino acids to support building lean muscle mass and improve recovery times. Use the Isagenix AMPED Pro Pak to achieve a leaner physique and experience optimal performance.